Great slow cooker recipes are some of my favorites–they’re extremely easy to prep, they taste great, and there’s minimal clean-up. If you’re like me, you like to eat a variety of tasty foods but just don’t have the time or inclination to prepare a big, fancy meal every day. And that’s why slow cooker recipes are our saviors. I’ve been all about this “one-pot” style of cooking for about 6 months now, and I’m loving it so much that my next cookbook is going to be dedicated to it. If you haven’t done a lot of one-pot cooking, you might be surprised how many different awesome dishes you can make with minimal prep (20 minutes or less) and clean-up (one pot, a plate or two, and your silverware). In this article I’m going to share with you 7 healthy slow cooker recipes that demonstrate some of the versatility and deliciousness of this style of cooking. Enjoy! 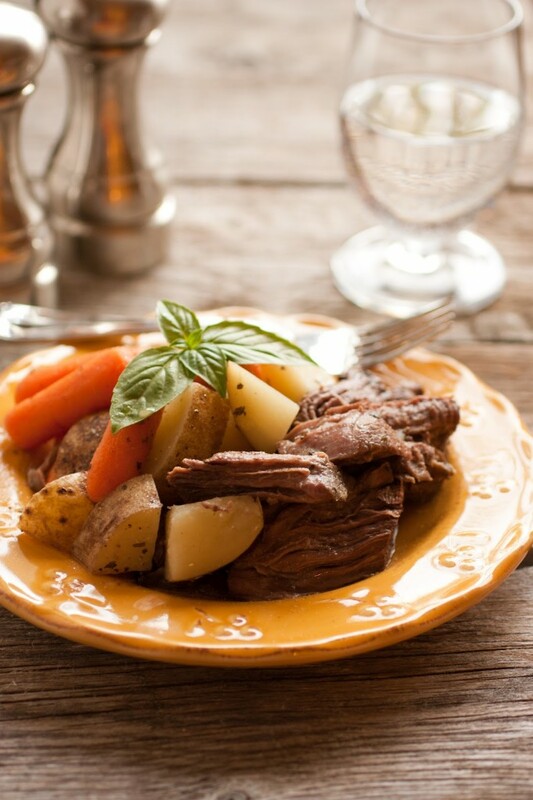 Sometimes it’s best not to mess with a good thing, and a simple pot roast and veggies is a classic that just doesn’t need to be messed with. While the simple flavors we all know and love are in this recipe, the method of preparing the ingredients makes it easier than ever to enjoy a comforting meal of meat and potatoes after a long, hard day. 1. Chop the carrots and potatoes, along with any other veggies you like. Sprinkle with a little salt, and wrap in aluminum foil. 2. Add the roast to the slow cooker, and season generously. 3. Place the foil packet of vegetables on top of the roast, and set to low for about 8 hours. 4. Unwrap the veggies, and remove the roast to slice. Home-cooked dinner doesn’t get any easier! Too afraid of ruining a beautiful (and expensive) filet of wild-caught salmon to actually try cooking it? Turn to your slow cooker to set your worries at ease. This’ll take just 10 minutes to put together, and once you see how easy it is to make perfectly flaky and tender fish, you’ll be eating salmon for breakfast, lunch, and dinner. 1. Begin by greasing the bottom of the slow cooker with about 1/2 Tbsp. butter, and then add the salmon. 2. In a heavy saucepan over high heat, mix together the water, lemon juice, garlic, onion, butter and all seasonings. Bring to a boil, stir thoroughly, and then coat the salmon with the sauce. 2. 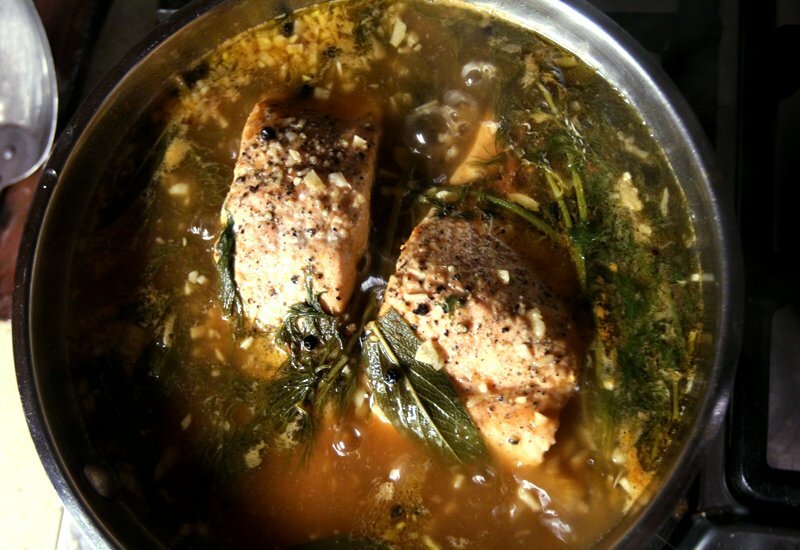 Set the slow cooker to low, and cook covered for about 3 1/2 hours, or until the salmon steaks easily flake apart with a fork. Don’t be scared off by this long list of ingredients; this classic soup will only take about 15 to 20 minutes to prep. Plus, all of the ingredients are pantry and produce staples. This recipe is vegan as written, but if you prefer to add meaty protein, substitute chicken broth and add Italian chicken or turkey sausage. 1. In the slow cooker, add all ingredients except beans, spinach, and pasta. Cover, and leave to cook on low for 8 hours, or on high for 4. 2. A half hour before serving, stir in the beans, spinach, and pasta. 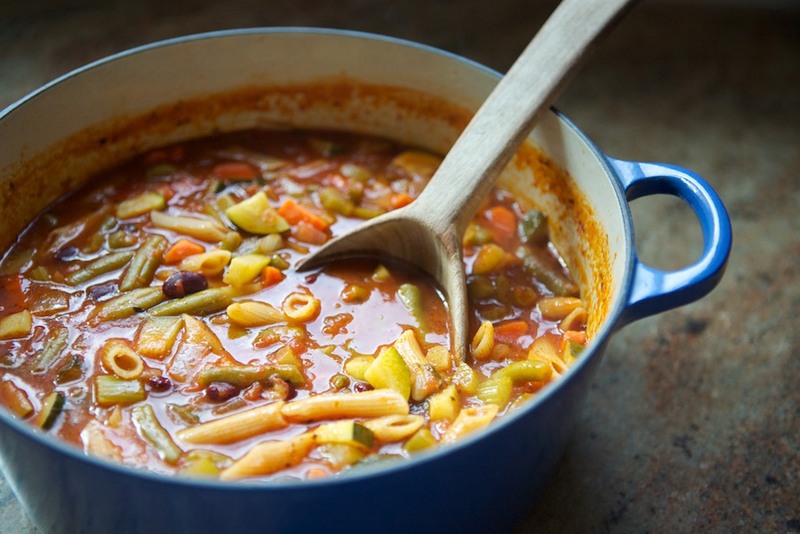 Once the pasta is done, your soup is ready! Hearty soups and juicy meats aren’t the only thing you can cook up in a Crock Pot. They’re also a great way to prepare grains, and since they heat the mixture slowly, you’ll be able to easily add protein powder without it curdling. This oatmeal is easy to prepare, and it’ll be ready and waiting for you first thing in the morning. 1. Lightly grease or spray the inside of a slow cooker with coconut oil. 2. Add all ingredients, and stir thoroughly. 3. Set the slow cooker to low heat, and cook overnight for about 8 hours. 4. 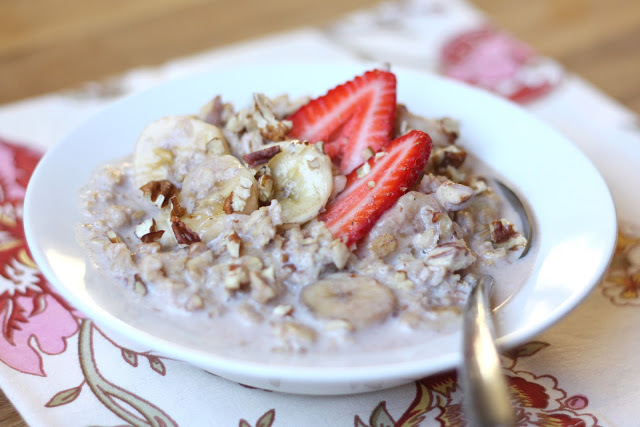 In the morning, give the oatmeal a big stir, and unplug the slow cooker. Let sit for 5 minutes. 5. Serve breakfast, topping the oatmeal with fresh fruit, almond butter, chopped nuts, grated ginger, coconut chips, or whatever ingredient you think sounds delicious. 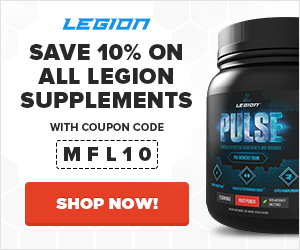 If you’re tired of eating baked chicken breast and canned tuna, this is an easy way to keep your diet interesting as well as global. If you’ve been to an Ethiopian restaurant, chances are you’ve had this staple dish. It’s spicy, but if you don’t mind heat, it’s a great way to get in a lot of protein. 1. To prep, roughly chop the onions, and mince fine in the food processor. In a small bowl, mix together the white wine and honey. 2. Marinate the chicken thighs in lemon juice for at least a half hour. 3. Place the butter, olive oil, onions, garlic, ginger, chicken stock, honey-wine, berbere and salt in a large slow cooker, and stir well. Add chicken pieces, and cover. 4. 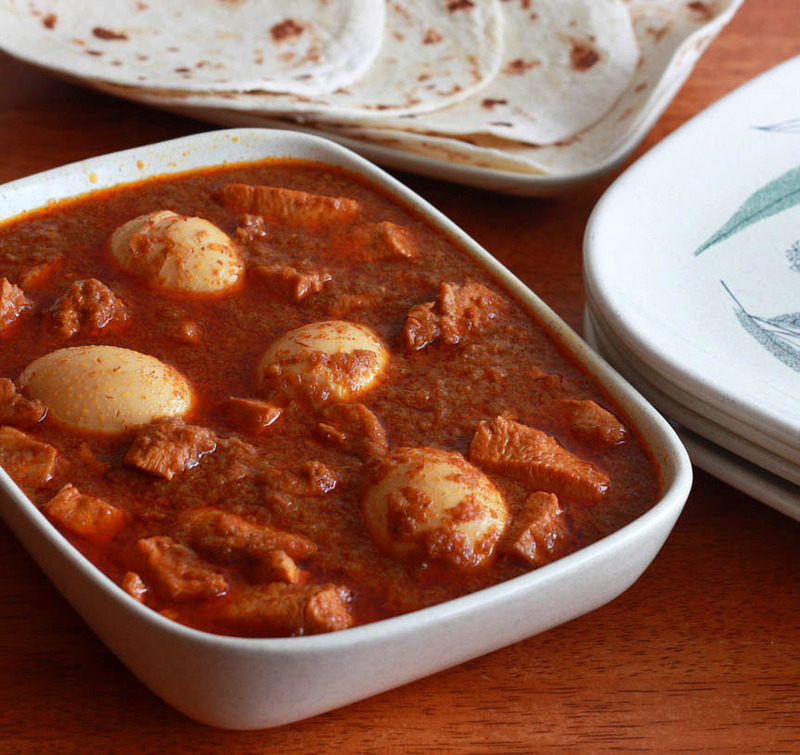 Cook on low for 5–6 hours, adding the boiled eggs 15 minutes before serving to soak in the sauce. 5. Serve with injera (Ethiopian flatbread) or over rice. There are endless uses for pulled pork so everyone should keep a go-to recipe like this one in their kitchen. Tape it to the fridge, if you have to, as a reminder to make a big batch on your day off to last throughout the week for sandwiches, salads, pizzas, quesadillas, savory pies, and so much more. 1. In an extra-large bowl, mix together orange juice, tomato paste, coconut sugar, smoked paprika, chili powder, cumin, oregano, sea salt, and black pepper. 2. Place the pork roast in the bowl, and coat with the mixture. Move the roast to the slow cooker, and pour the spice liquid on top. 3. Set the heat to low, and cook for 6–8 hours, until the roast is tender enough to pull apart with a fork. 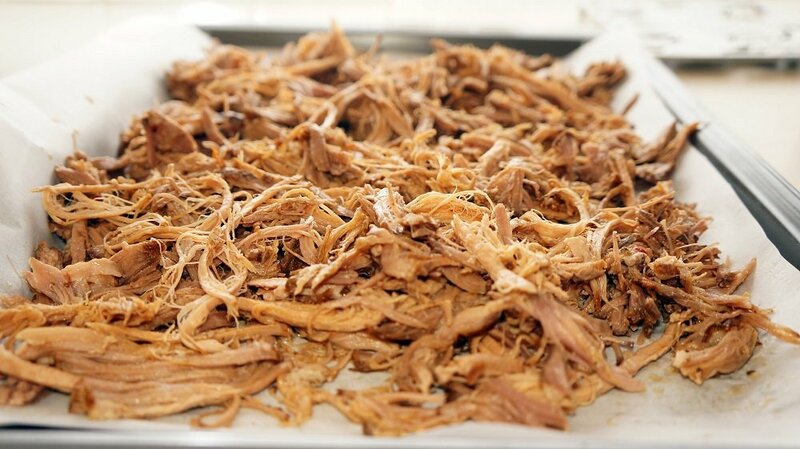 When it’s ready, shred the meat, and stir the sauce into the pulled pork. You’ve got breakfast, lunch, and dinner out of your slow cooker – why not dessert too? Rice pudding has long been praised as a dessert for dieters. But believe it or not, it gets better. Farro beats out rice nutritionally, containing more fiber than brown rice, more protein than quinoa, and tons of minerals like magnesium and iron. 1. Gently stir farro, coconut milk, low-fat milk, water, sugar, and salt together in the slow cooker. Cover. 2. Set to low heat, and cook for 6 to 8 hours. 3. 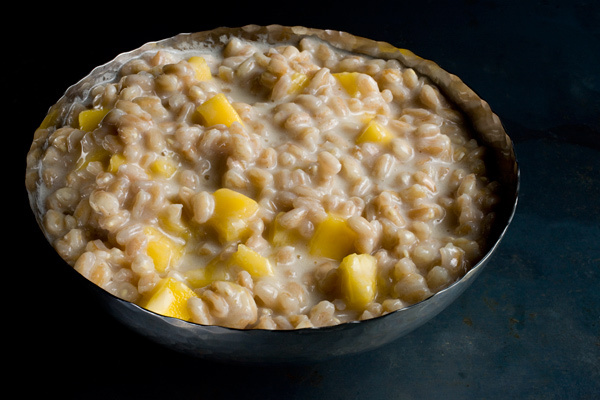 Serve the sticky farro warm, and top with ripe mango or other fresh fruit. Store leftovers in an airtight container for up to a week. What did you think of these healthy slow cooker recipes? Have anything else you’d like to share? Let me know in the comments below!